What is Ripple? Why would you like to measure it? Ripple is the is the small unwanted residual periodic variation of the direct current (dc) output of a power supply which has been derived from an alternating current (ac) source. This ripple is due to incomplete suppression of the alternating waveform within the power supply. In AC to DC converters, AC voltage is apparent. But in DC-DC converters, we are switching the input DC. This results in the ripple being introduced. The below waveform shows the DC Supply and Ripple or AC Component in a AC-DC Supply. Looking at this level, it looks like a constant DC is achieved. How you can measure ripple by Instrumentation available on Production Shop Floor? We are going to test this SMPS at no load condition. This is within the claimed tolerance level of 2%. Electronic Meter shows 5.040V dc. The question still remains, what is the Ripple it is giving at No load? Next we select the AC Voltage on the Multimeter. In above image you can see the AC Voltage present with DC. The ripple voltage is 0.021 V . That is , 21mV. This is the way ripple is measured. And according to us, this is the way ripple is measured. Here we are going to calculate ripple percentage . We have seen is testing laboratories also, that this is the accpeted method. This video shows how to measure and analyse the ripple in any SMPS. Ripple is generated due to charge and discharge of capacitor. Noise is everyhing else on high frequency. This videos shows the difference between Analog and digital oscilloscope. It shows the waveform in both oscilloscopes. Digital oscilloscope may be slow due to high calculations and analog is fast. Ripple measurement is also depend on connection type between scope and supply. There is an internal resistance presence on probes. due to which waveform may be looking distorted more. This video also stated the bandwidth of ripple voltage present in SMPS. 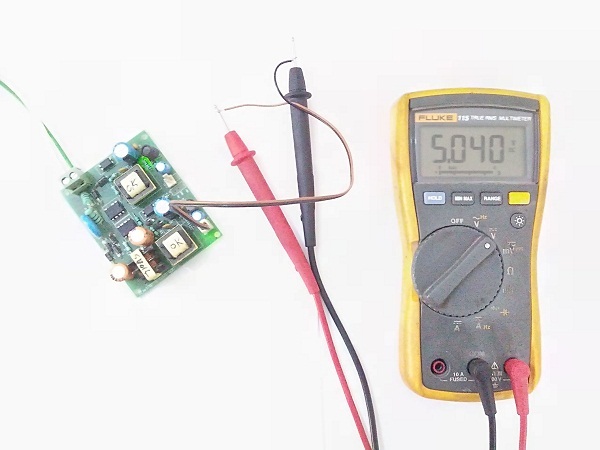 This Video shows the analysis of 5V 2A power supply. It contains 2mV ripple of 20MHz Bandwidth.